The delegation of the Council of Europe visited Georgia to prepare the CoE Secretary General's 17th consolidated report on the Conflict in Georgia. The Deputy Foreign Minister provided participants of the Conference with detailed information on the latest development in the Abkhazia and Tskhinvali regions, as well as on Russia’s policy aimed at annexation of the occupied regions, in particular, the ratification of the so-called agreement regarding incorporation of the Tskhinvali region military units into the Russian army and the opening of the so-called checkpoints in Sokhumi and Akhalgori. This, agiants the background of the installation of artificial barriers along the occupation line, further restricts the local population’s right to free movement. David Dondua expressed his concern over the ethnic discrimination of Georgians living in the Abkhazia and Tskhinvali regions, including the banning of the Georgian language instruction. Special note was taken of deliberate destruction of houses of ethnic Georgians in the village of Eredvi and of the need to ensure the protection of the property rights in the occupied regions. 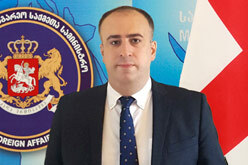 The Georgian Deputy Foreign Minister spoke about the results of the Geneva International Discussions. David Dondua thanked the delegation of the Council of Europe for active engagement in confidence-building measures.